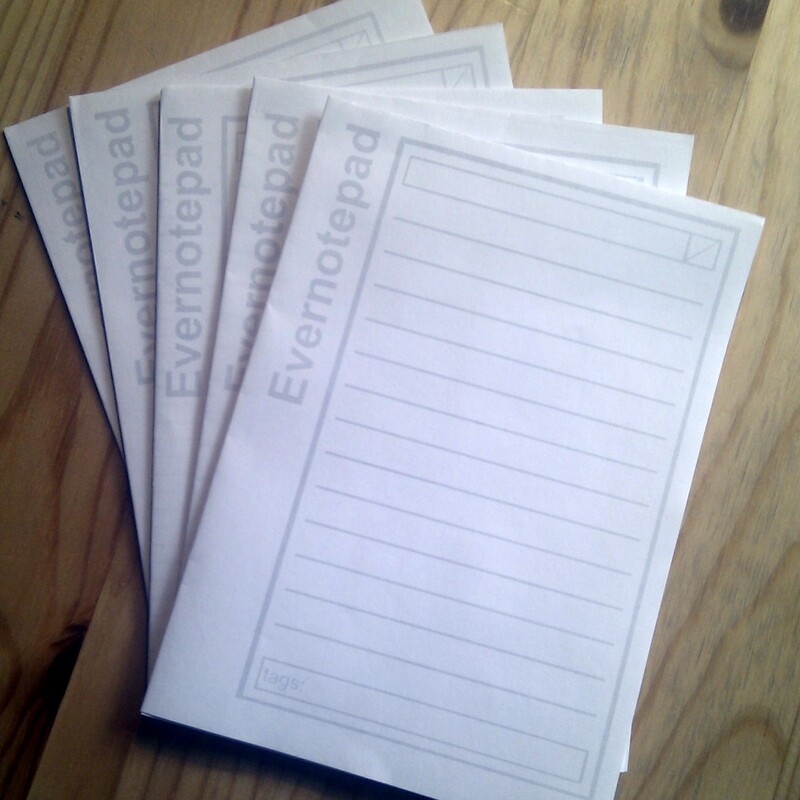 I have been trying to include Evernote in my note-taking effectively across all platforms. The paper based notes were always the weakest link. Remembering to snap. Having a custom notepad will remind me to photograph and upload the notes either as I take them or as I dispose of the paper. Keeping it neat. As much as I try to keep them tidy my notes rarely are. The Evernotepad provides a boundary that matches the aspect ratio of my phone camera and a tags box that I can use to ensure that at least key words are legible. It makes good use of wasted paper and I am hoping it will fit in easily with my processes and I will try and comment to let people know. In the meantime, if it is useful to anyone, here it is – Evernotepad. If there is anything else out there similar to this (perhaps that caters to different paper sizes and phone cameras) let me know and I will update the post with links. I have been trying very hard to implement a David Allen style GTD list system to jeep me organised and productive. I read ‘Getting Things Done’ a few years back and got a real kick out of the process. Ever since then I have been looking for the perfect implementation. Now I am not so much the pragmatist that I expect the system to fit me (or rather for me to fit the system) without any adjustment, so I have always been open to the odd tweak here and there. Despite adjusting the system in varioua was I am always left with the same major issue, which has always been collection. There will never be a single method to collect up all of these open loops, no unified inbox. That said, an internet connected smartphone comes pretty close! About as close as I can hope for now. I had signed up to the list making service Remember The Milk (www.rememberthemilk.com)a long time ago but it was not until a friend demonstrated the iphone app that I took the plunge and signed up for a premium account ($25 per year) and started using it on my Android phone. It was not immediately successful, but with some ongoing list tweaking that I have detailed below it is getting to a place that is working. I am not the first person to do this I am certain, but in case it can help someone else get things done here is my system as it stands. One of the ways in which I have found to adapt the RTM setup for a GTD workflow is to take advantage of tags and smart lists, which are saved searches. Using these I can tag the tasks in a number of ways and then filter those tasks to create GTD approporiate lists. Inbox is (very usefully) a default list for all items added to RTM. I can therefore operate in a very GTD manner dumping all thoughts, ideas, todos and anything else with a minimum of keystrokes for processing. The second list I use is called Processed. All items are moved out of Inbox and into Processed once I have done just that. What that actually entails is detailed below. Shopping is not really a GTD list. It is a separate list for when I actually need to ‘remember the milk’. I find it useful to keep these bits separate. The method if processing I use involves the standard identification of next actions and then adding as much contextual information to the task as possible by way of tags. I then string together those tags as saved searches to create soft lists that resemble the GTD method a little closer. The tags are split into 3 basic ‘types’ – State, Project and Context. The tags each have a common prefix, so that they remain alphabetically distinct from one another in the tag list (custom taxonomies would be useful here to separate them, but that may be a little too much to ask from a shopping list webapp). When processing, eah task should have at least one of each of these types of tags. There are currently 4 state tags and an item should only have one of them. The State tags have no prefix. Generally, i try to make sure a task will fit one of these four states only. The project list feels like a little bit of a hack, but it works well enough for me. I could just examine the tag list for project tags, but having a separate (and more readable) Project list makes for easier review. Each item is assigned a project tag. Project tags have an underscore prefix and words are separated by underscores. There is a hierarchy to project tags that group them together by topic eg:- _personal_DIY, _personal_finances, _work_reports etc. Item should have at least one of these (though it may be appropriate to have more that one). Context items use an @ prefix (@call, @online. @errand). The @ prefix is also used by RTM to quick assign locations to tasks. This is not to much of a leap as a location generally is itself a context. I have kept the @ naming convention for both contexts and locations. The only issue with this common prefix is that when quick-adding a task one enters #@ as a prefix fit these context tags (# being RTMs shortcode for tags) and enters @@ for a location. Not to much of a brain buster. I then have several saved searches to reflect the GTD list and context specific lists. RTM allows for some fairly complex searches so you can be quite specific. The only issue with that being that the more specific the searches are the more likely a task will not get picked up if it has ot been processed correctly. I did read a recent Lifehacker post exploring a search for catching these lost tasks and I will probably look into adapting it for my own lists. Below, for your reading pleasure, some of my smart lists. Adding context or project filters to the first list is also useful, particularly in regards location. Now if I could share smart lists with colleagues (a sadly lacking feature) my life would be complete. The easiest thing would be to point you towards http://status.net, which is the homepage of the company but, as a fan of making things complicated, I will try to explain it myself. Microblogging is posting your thoughts online in bitesize chunks (generally in 140 characters or less) on services like the massively popular www.twitter.com (You can see my tweets here). When it started out a lot of people wondered (and still wonder) what the point of such a small amount of information would be. Why would anyone bother posting or reading anything that is just 140 characters? The answer turned out to be lots of people. Triviality is a term that applies to a global landscape but that collapses in a hyperlocal landscape like that of Microblogging. That is to say that rarely is a post trivial to the individual. Sure, there is plenty onwww.Twitter.com/markversus that is nonsense, but a lot of the content is of great interest to a small group. The follow model of Twitter where people choose exactly what information they want to reach them means that each post is going only to those who care to hear it and s such no post is unimportant. A user that posts information about train times in a small village is of no importance to most people in the world but essential to the small group of users that it serves. The low overheard in effort and resource makes microblogging the perfect platform for putting out this information. The speed at which posts are published (both because they are instant and because they are short) makes microblogging a perfect medium for disseminating up to the minute information. This is where Twitter as a service really came in to its own. People were able to get news faster and from a wider variety of sources than ever before and an increasing number of news channels now monitor the real-time web to keep on top of stories. Recently the Iranian elections and earthquakes in Chile and Haiti have proven the value of the medium in this context. It also proved its weaknesses – namely that the material on these sites is often unqualified and may be prone to error or exaggeration or a general misunderstanding of context. The prevalence of Facebook and its Status Updates prompted by “Mark is…” or similar introduced many people to publishing and consuming these short bursts of information. It is now fair game to put out any small piece of information into the public domain. No matter how niche or how trivial it may be. StatusNet is a microblogging platform. It is the software with which a microblogging service is built. And it is Open Source. At the moment the leader in the world of microblogging is www.twitter.com. It has been around the longest and has refined its service with some great features, such as lists and search. It is also the most widely populated. It has millions of users and billions of messages. It has a weakness though. It is a closed system. Twitter only interacts with Twitter. They have a number of tools for programmers to help develop software to join the service together but the underlying protocol is closed. An example would be (as it used to be) only being able to email those people on the same email provider as you. StatusNet is a system built on open source software and is designed to be federated so that users on any system built using these protocols can interact with any other. It is also built using software languages and tools available as standard with almost any web hosting provider or that are free and available to anyone running their own server. The implications of this are likely to be long term growth and adoption of these protocols as a standard and widespread use across the web dwarfing the numbers of people that could congregate on any single service like Twitter. The largest public installation is probably www.identi.ca and you can sign up for an account straight away. Status.Net have started to provide their own hosted solutions and of course you can set up your own. I tried. It is not massively complicated but certainly not trivial and requires your own server, but the benefots (like being able to aggrgate status updates from other services) is great. Oh, and no that you’re down here, you really should visit www.status.net to take a look at some of the features of your own, federated microblogging service.